New Haven police may have an issue on their hands. It’s important to note all of the facts have yet to be presented to us, but at first read, it looks like someone was arrested for doing something he was legally permitted to do. We’re not going to discuss people who freak out at the sign of a person carrying a gun, that’s not what this is about but it does look like a few people saw this man’s holster and/or gun, freaked out in the movie theater and called the cops. Did they leave the premises? Did they tell other people to leave? Nope, looks like they just called the cops, and New Haven PD responded in force. New Haven Police apprehended a man who brought a loaded handgun into a movie theater during a showing of “The Dark Knight Rises” on Tuesday night. [The accused], of New Haven, was arrested and charged with breach of peace and interfering with police after it was discovered he brought a loaded hand gun into the theater. According to police, an usher said at least three patrons inside the theater saw that Hwang had a holster with a gun in it and alerted theater staff who then called police. Police entered Theater 1 and asked the patrons to raise their hands and file out of the theater. As they exited, they were patted down and escorted outside. The officers identified Hwang as the suspect, drew their weapons and ordered him to put his hands up. According to police, Hwang remained in his seat using his cell phone. My guess is that he may have been calling his lawyer. I’m not sure about the interfering with police charge, but the accused can not be charged with breach of peace for doing something he is legally able to do. This entire case should be thrown out immediately. Important previous post – copy and pasted in its entirety – for the New Haven police and prosecutors. Yes, you can open carry a pistol in Connecticut – From Sept. 3, 2010. And you can responsibly carry a pistol in a bar that serves alcohol, and you can even carry your firearm on college campuses. I thought most of the misconceptions concerning Connecticut state law when it comes to permits and carrying handguns had been squashed, yet some continue to put totally false garbage out there. I’m not going to speak to any specific case in Connecticut, but I am going to briefly review the completely false comments made here on this blog by “Army Strong” over at this post. Ongoing Myth: Connecticut law requires handguns be concealed, and furthermore your gun can not be able to “print” and let people know you are carrying a firearm. Totally false. Connecticut permits are defined as a State Permit to Carry Pistols and Revolvers. There is absolutely no reference to any law concerning concealment or where you can carry on the permit itself. 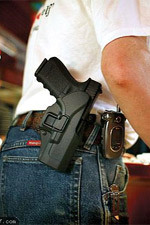 Note, you must have a state permit to carry openly or concealed in Connecticut. How can I prove this? Well, it’s difficult to prove a negative since laws do not point out what you can do, but there isno statute requiring concealment. That said, the Connecticut Board of Firearms Examiners has posted answers to questions submitted on its website. The answers were provided by Veronica Rose, principal analyst at the Office of Legislative Research. This following is not submitted as legal advice. Is there any statute prescribing that firearms must be carried concealed? The answer is no. The law does not address this issue. But, with limited exceptions, it is illegal to carry a handgun, whether concealed or openly, without a permit, except in one’s home or place of business CGS § 29-35(a). Prior to a 2nd Amendment rally at the Connecticut State Capitol on April 10, 2010, the state police sent out a memo specifically clarifying the law for troopers who would be present at the rally assisting Capitol Police. Unfortunately, it is not signed or dated, and the second page may be missing. In part, it reads. State Police personnel should not arrest a properly permitted individual merely for publicly carrying a handgun in plain view. Even the Hartford Courant posted an article in April 2010 noting it was completely legal to open carry in Connecticut. A state Superior Court judge dismissed the breach of peace charge police ultimately filed against Goldberg, forcing law enforcement experts to concede that, absent extenuating circumstances, there is nothing in Connecticut law to prohibit licensed gun owners from conducting their lives visibly armed. Ongoing Myth: You can not carry a handgun in an establishment that serves alcohol. Totally false. Again, from the same list of questions and answers provided by the Office of Legislative Research. Is the carrying of a handgun on premises with a posted sign banning firearms critical to a permit revocation decision? The law is silent on this issue. The pertinent statute reads as follows: “[T]he issuance of a permit to carry a pistol or revolver does not thereby authorize the possession or carrying of a pistol or revolver in any premises where the possession or carrying of a pistol or revolver is otherwise prohibited by law or is prohibited by the person who owns or exercises control over such premises” (CGS § 29-28(e)). In other words, the direct answer to the question is no, there is no law stating you can not carry in a bar. That said, Connecticut State law is clear that you can not be intoxicated – defined as a blood alcohol level of .10 or higher – while carrying a firearm. This is specified in CGS §53-206d and if convicted, it’s a class A misdemeanor. Ongoing Myth: You are very limited as to where you can carry a firearm. All in all, we don’t have it too bad in Connecticut. There are specific areas where you can not carry, and they are spelled out in legislation. 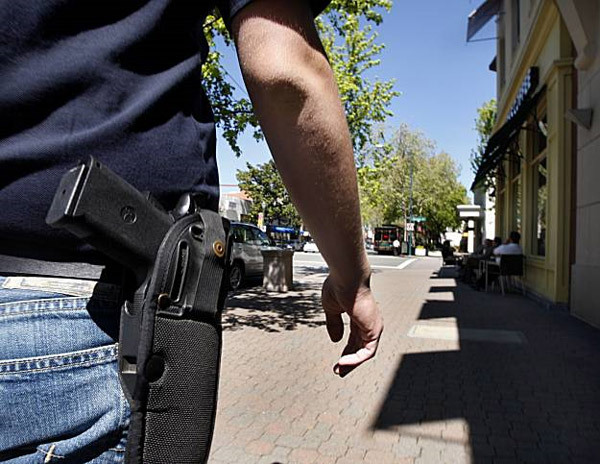 It should be noted there are some towns – including New Britain and New London – who have town ordinances that ban you from carrying concealed, yet interestingly they do not ban open carry, which again is legal in Connecticut. You can not carry in or on the real property comprising a public or private elementary or secondary school, or at a school sponsored activity. (CGS §53a-217b) Note that public and private colleges and universities are not mentioned. Although I can not site the statutes, (sorry) I believe it is also against the law to carry within the State Capital or where the General Assembly is meeting or at a legislative public hearing. I’m not sure about state forests either. There may be other town or city ordinances concerning carrying in parks. Federal law states you can not carry in federal facility including post offices, but you can now definitely carry in federal parks, just not the federal facility buildings I would assume. Of course, if you visit any private residence or business, they do have the right to ban firearms and they can ask you to leave. Carrying in a private residence or business is certainly not illegal, but if you are asked to leave and do not leave, you are subject to a trespass arrest. Ongoing Myth: You will be charged with breach of peace if you carry openly in Connecticut. Sec. 53a-181. Breach of the peace in the second degree: Class B misdemeanor. (a) A person is guilty of breach of the peace in the second degree when, with intent to cause inconvenience, annoyance or alarm, or recklessly creating a risk thereof, such person: (1) Engages in fighting or in violent, tumultuous or threatening behavior in a public place; or (2) assaults or strikes another; or (3) threatens to commit any crime against another person or such other person’s property; or (4) publicly exhibits, distributes, posts up or advertises any offensive, indecent or abusive matter concerning any person; or (5) in a public place, uses abusive or obscene language or makes an obscene gesture; or (6) creates a public and hazardous or physically offensive condition by any act which such person is not licensed or privileged to do. For purposes of this section, “public place” means any area that is used or held out for use by the public whether owned or operated by public or private interests. With reference to the above, can someone let me know where inadvertently exposing your pistol [or open carry] would cause a breach of peace? All breach charges in Connecticut that I know of were thrown out of court. You can also read the statutes for creating a public disturbance CGS §53a-181a, and disorderly conduct CGS §53a-182 and you will not find any reference to open carry. Again, I’m not a lawyer and I’m not going to go into specific cases. You can find additional information about this subject around the net, including the Connecticut Citizen Defense League website and the Connecticut section of the OpenCarry.org forums. Add your references in the comments section below. This post deals almost exclusively content concerning carrying pistols. If you found it interesting and want to learn more, check out my post concerning the feel good Connecticut assault weapons ban that is totally irrational. The police invaded this guy’s privacy. I hope he sues the New Haven Police and prevails. They also created a dangerous situation — people could have panicked and stampeded.? The Nanny State Neurosis is progressing.? Was he the only one in the theater packing? Most likely the cops found him and let everyone else go. The upshot is: wait for the DVD to be released. Even though you have right to carry an exposed weapon, with a permit, this is why you shouldn’t: 1. after the resent shootings it causes alarm. 2 theaters can prohibit weapons in the theaters. ( That leaves who in the theaters?) 3 If you show your weapon, who is the first one shot by the criminal? I have been legally carrying a weapon for over 50 years.? When ever possible I preferred it come as a surprise to the bad guys that I was armed. 1. Causing “alarm” or making people uncomfortable is not an?arrestable?offense. 2. Theaters can prohibit weapons on their personal property, that said, all they had to do was ask the guy to leave and if he did not, he would be subject to a?trespass?arrest if he did not leave. 3.?Find me one documented instance where a person – who was not a security guard or law enforcement – was “the first one to be shot by the criminal.” That’s pure hogwash. The criminal will always be surprised you are armed, if they do not expect a security guard or LEO to be?around. 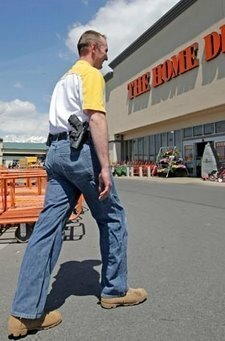 Read this open carry argument. Police cannot be sued successfully in Corrupticut. Ken Krayeske proved it. I found it out when I was charged with BofP when a state”Meter Maid on Wheels” & HPD officer Faienza perjured themselves when she saw my gun-no one else did. The charges were dismissed by Judge Gold. But when I tried to sue he completely ignored his own ruling & allowed the State’s & City’s Atty & more time. My young lawyer wanted to continue the case but I saw no amount of right or money would prevail in our corrupticut judicial system. Pitiful police work. They didn’t even use a drone or Tase anyone during their false arrest. Don’t you expect the ACLU to be all over this racially motivated harassment and false arrest? I would love to see the ACLU get involved with their deep pockets,the-same pockets the state uses-our tax money. But they won’t,they too are fraught through & through with corruption. There is no reason for the other person to be alarmed. None. ?That’s the problem … How do you change some of the public’s irrational fear of guns? They see cops and plain-clothes LEOs carrying all the time. Are they alarmed? What’s the difference? ?Does a badge – that nobody can read unless they are within a couple of feet – somehow take that fear or alarm away? Do you realize how irrational that is? I’m not saying I would open carry or that I do, but there are very valid reasons to open carry, and the only reason to carry concealed – other than personal preference – is to not offend someone else. Places that I frequent,like my bank,I show my gun to those there so they won’t be alarmed if it’s seen by mistake. New Haven: where the illegals are legal, and the legals are illegal. Welcome to the liberal Bizarro world! I have fear of guns (and other things). I don’t call it irrational. Guns fall into the same category as electricity, gasoline, bodies of water and motor vehicles: They are all dangerous.? But with knowledge and respect, all can be handled responsibly.? People with arachnophobia or vertigo don’t think their phobias are irrational either. Steve M., I respectfully disagree with your last comment about there being no reason for the other person to be alarmed.? Given the theater shooting, I think there was plenty of reason to be alarmed.? It’s a shame that this man’s right to carry caused such an uproar, but I’m sure it’s due to the fear of copycat shootings.? I learned something this morning, he did not have to have his weapon concealed.? I assumed he HAD to conceal his gun.? It’s too bad he didn’t have a bit more sensitivity, realize people are on edge due to recent events,.? But I do realize? that sensitivity was not a requirement, and he was well within his rights. Dims you are right. I know a person who loves hunting with a rifle and he suffers from arachnophobia.